Unique Identification Authority of India (UIDAI), has launched unique identity of Aadhaar for every Indian Citizen, Aadhaar card is identical to the Indian Citizenship for every resident in India. It is designed with 12 digits random number issued by UIDAI to the residents of India after satisfying the verification process laid down by the Authority. Any individual person, irrespective of age and gender, who is a resident of India, may voluntarily enroll to obtain Aadhaar number, the UID enrollment process is at free of cost. It will be used as an ID proof. People who are willing to get Aadhaar card in their mobiles can have some steps to follow, every person needs Demographic and Biometric information to enroll for Aadhaar Card. Demographic means person details like Name, Date of Birth, mobile number etc. Biometric means person fingertips and face detection, De-duplication of Aadhaar card will be applicable once, for each person. It is mandatory for every scheme. Aadhaar identity platform with its inherent features of Uniqueness, Authentication, Financial Address and e-KYC, enables the Government of India to directly reach residents of the country in the delivery of various subsidies, benefits and services by using the resident’s Aadhaar number only. Initially, UIAD issued Aadhaar card in the Paper format. Now they are upgraded to a lot of schemes and services and Apps at present Aadhaar Card can be downloaded through mobile application mAadhaar App also. The main objective is promoting Digital India, the government has launched the mAadhaar App. mAadhaar is a mobile app that will work only on the Android platform. After downloading and registering this app, you do not need to run with you in a paper format or in any other way with a base card or number. UIAD currently the iOS app is in the pipe though there is no indication when the iOS app will be launched or even that will have any future or not. In future, all the mobile versions of IOS, windows mAadhaar apk will be available. UIAD has launched the new application for the mobile user to get Aadhaar card through mobile. It will be more convenient and easiest way to carry ID proof. The application works at Android 5+ version. 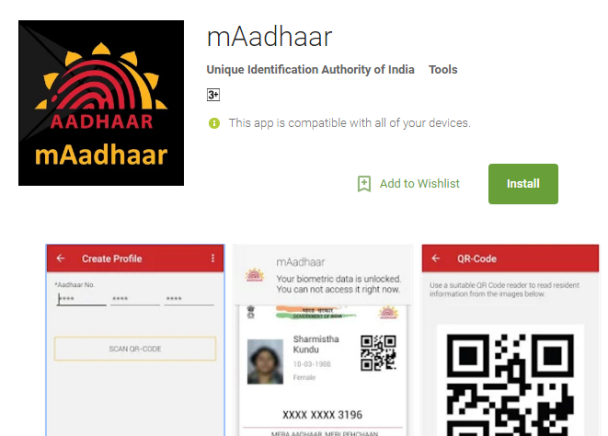 To download mAadhaar app visit Google play store. Click on Apps link. Search for mAadhaar application. Download an application and install the application. There will be some steps to complete the process. mAadhaar App will be downloaded on the mobile, the pplication will ask OTP, so download the application on only registered mobile number. Automatically application will receive OTP. Download mAadhaar card. One Aadhaar Profile can be active on only one device at a time. If any people create the profile on another mobile by inserting the SIM in another device, the previous profile would become inactive and would be deleted from an older device. If your family members have registered same mobile number then add the profile to your device. A user can add the maximum of 3 profiles in the device with the same mobile number registered in their Aadhaar card. How to Create a Profile in mAadhaar Application? First of all, ensure that your mobile connection is in an active state or not and using the registered mobile number or not. Enter 12 digit numbers or scan Aadhaar card. OTP will be generated and automatically it will be detected and profile will be generated. allow an app to read SMS while downloading mAadhaar APK. Otherwise, go to Phone settings and allow the permission to read mobile SMS. Can mAadhaar App work offline? mAadhaar mobile application needs the internet connection to work because UIADI mobile services will work only in online. What is TOTP? How can be utilized? Time-based One-Time Password is automatically generated password instead of OTP. Does mAadhaar Application works on IOS & Windows? Currently, the mAadhaar application is working under Android 5+ versions. Now currently there is no application available for IOS and Windows mobile users. How many mAadhaar Profiles can be added with same registration mobile number? only 3 profiles will be accepted for the family with the same registered mobile number. If I changed my SIM card to another device is the profile active on another device? No, one profile with same registration number will be accepted on one device. If you change SIM card to another device last device profile will be deleted and on the new device, the user needs to activate profile again by downloading the mAadhaar application.